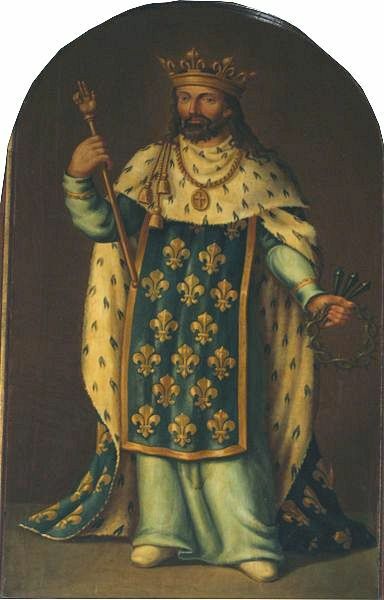 St. Louis, king of France from to 1236-1270, was known for his generosity and hospitality. Every day King Louis had 13 special guests from among the poor to eat with him, and a large number of poor were served meals near his palace. During Advent and Lent, all who presented themselves were given a meal, and Louis often served them in person. To remember King St. Louis of France on his feast day let us recall his hospitality with a French dish. 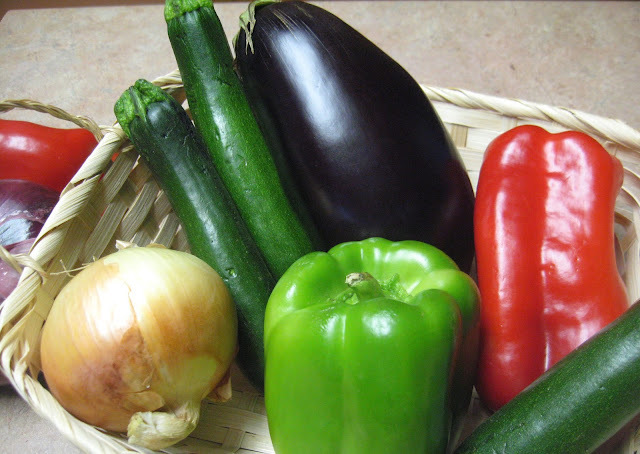 Ratatouille is a hearty French dish and the vegetable ingredients are abundant now in late summer. It seems a fitting dish to prepare in honor of King St. Louis and experience a little French cuisine. And in the spirit of King St. Louis, invite some guests to share the meal with you. Peel the eggplant (if desired) and chop into bite-sized cubes. Transfer them to a strainer set over a bowl and toss with a tablespoon of salt. Let the eggplant sit while preparing other ingredents. Dice the onions and chop the peppers, zucchinis, and tomatoes into bite-sized pieces. Mince garlic. Veggies will be cooked in batches. Warm a teaspoon of olive oil in a large Dutch oven or pot over medium-high heat. Add onions and salt to taste. Sauté until the onions have softened and are just beginning to brown, (approx. 10 minutes). Add the peppers and continue cooking until the peppers have softened (approx. 5 minutes). Transfer the onions and peppers to a clean bowl. Add another teaspoon of oil to the pot and sauté the zucchini with a generous pinch of salt until the zucchini has softened and is beginning to brown (approx. 5 minutes). Transfer the zucchini to the bowl with the onions and peppers. Rinse the eggplant under running water and squeeze the cubes gently with hands to remove as much moisture as possible. Add 1 teaspoon of oil to pan and sauté the eggplant until it has softened and has begun to turn translucent (approx. 10 minutes). Transfer the eggplant to the bowl with the other vegetables. During cooking, a brown glaze will build on the bottom of the pan. If it looks like this glaze is starting to blacken, turn down the heat. To dissolve the glaze between batches add 1/4 cup of water or wine into the pan and scraping up the glaze. Pour the deglazing liquid into the bowl with the vegetables. Finally add 1 teaspoon of olive oil in the pan and sauté the minced garlic until starting to turn golden. Add the tomatoes, bay leaf, and sprigs of thyme. As the tomato juice bubbles, scrape up the brown glaze on the bottom of the pan. Add all of the vegetables back into the pan and stir until everything is evenly mixed. Bring the stew to a simmer, then turn down the heat to low. Stirring occasionally, simmer for at least 20 minutes or up to 90 minutes. Remove the bay leaf and thyme sprigs. Just before taking the ratatouille off the heat, stir in the basil. Bon appetit! 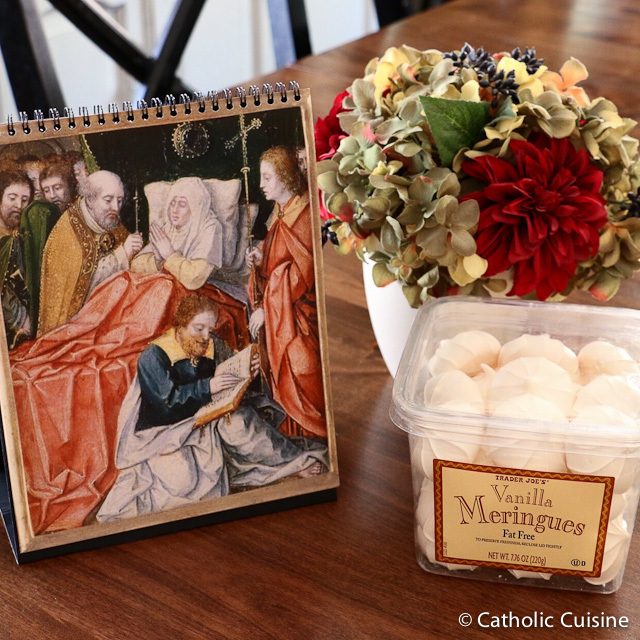 I picked up a box of Vanilla Meringues - "Heavenly Cloud Cookies" - from our local Trader Joe's to serve as a little treat following our family rosary. Additional ideas and recipes can be found in the archives.